So I haven’t had much time to watch films lately, and when I have tried I have just been frustrated. Arggghhh. It’s hard to be a Hindi film fan. At the risk of sounding bitter and repetitive, let me just say (again) that I *hate* Indian dvd manufacturers. Example 1: Jaal (1951) starring Dev Anand, Geeta Bali, Purnima, KN Singh. Directed by Guru Dutt. DVD from Nupur. This may have once been a lovely film, but in the hands of Nupur it has been turned into barely-90-minutes’ worth of random unconnected vignettes. There is nothing coherent left of the story, to the point where it is virtually unwatchable. Scenes and songs end abruptly in the middle and we skip to a completely unrelated scene or song which is also cut short abruptly. Nupur kindly filled in the rest of the dvd space where the movie should have been with ads. At least they didn’t charge us any extra for that (or any less, either). 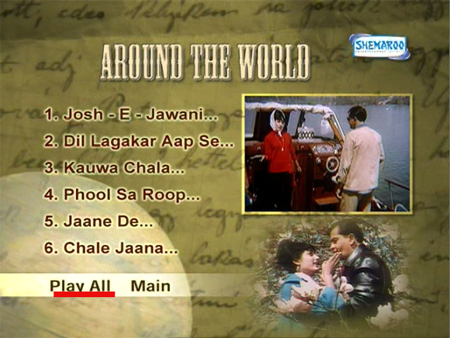 Example 2: Around the World (1967) starring Raj Kapoor, Rajshree, Ameeta, Mehmood, Pran, Prem Chopra. Directed by Pachhi. DVD from Shameroo. I had no illusions that this would be a good film (I had already been warned!) but I took the plunge anyway since I love many of the songs—especially the lively “Yeh Munh Aur Masoor Ki Daal”. Oh but hey guess what?! Shameroo cut the song OUT! And three other ones too! Not that they let us know that via any kind of disclaimer on the packaging or anything (or any kind of discount). All I was left with was a sucky movie with only six out of the original ten songs (and not the best ones, either). 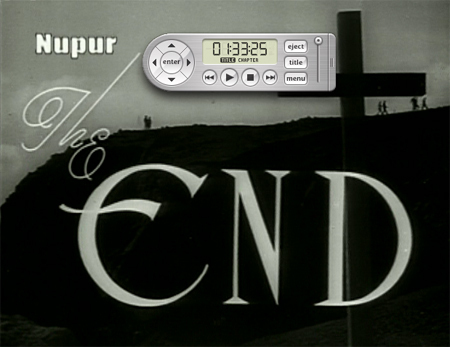 Example 3: Pukar (1939) starring Chandramohan, Sohrab Modi, Naseem Banu. Directed by Sohrab Modi. VCD from fRIENDS. On the left is the newly released vcd version (no subtitles) from fRIENDS (in case you somehow missed that). On the right is my copy (thanks again Muz! ): a dvd made from a videotape that was taped from British television two decades ago (with subtitles). Just goes to show that you shouldn’t expect a better product—and in this case it’s even worse—from an Indian disc manufacturer than you already have from an old videotape. Pretty much the only “enhancement” you can count on is a huge ugly logo. At least I didn’t have to pay any money for this atrocity (thank you interwebs!). Posted on February 19, 2010 at 9:04 am in Hindi movies	| RSS feed You can skip to the end and leave a reply. I was initially very happy when DVDs/VCDs of old movies first started coming out a few years ago. I thought I could get rid of the bulky videotapes in my collection and replace them with the nice, slim, prettily packaged DVDs/VCDs. I abandoned that wild notion as soon as I watched the very first DVD I purchased (Teesri Manzil of course). Sigh indeed. Yup, hang on to those videotapes—they could be the best quality you’ll ever get! I was really pleased too, just to have access to these older films….but I’m seriously beginning to wonder if what we’re getting really IS better than nothing. And for people who don’t know better (me!) it really can misrepresent the true quality of these movies. I am still waiting for the chance to see ALL of Teesri Manzil. BIG SIGH. The problem with old Bollywood movies on DVD is the transfer. Why can’t we have something like Criterion for some of the old classics? And don’t get me started on Blu-ray (or the absence thereof). So I agree with you. A few years ago I watched Pyaasa on Netflix. Although I felt the movie was top-notch, I could not rate the DVD highly because I couldn’t make out what they were saying (and I understand and speak Hindi). I also wanted to say (at the risk of sounding like a an automated spammer) that I think you have a fantastic website. We desperately need a Criterion equivalent, DESPERATELY. Guru Dutt’s films are among the worst treated—the picture is so dark you can’t make out anything half the time, and sound is terrible. It’s just criminal. I just went to investigate your site and got sucked into not paying attention to my conference call! :) Love love love your avatar too! I agree with you. What is up with forcing people through 30 minutes of ads at the top of the DVD as well? Thanks so much. You totally need to see “Rock Dancer” which has the “you are my chicken fry song”… I’ve posted a rough translation of the first four lines on my site, but it isn’t the same deal. Here’s a “fun” question – you ever had to knife a DVD out of it’s box? I have and the only reason I still own Doli Saja Ke Rakhna is so that it reminds me NEVER to buy another T-series DVD again. It seriously wouldn’t come out of the box without the help of a very sharp object. I was afraid for the DVD, for myself, for T-series if I ever walked across their offices anywhere.. Good god. I usually have the opposite problem—when the dvd arrives the disk itself has been rattling around loose and uncontrolled inside the case and is scratched so badly it won’t play! But yes. Good God. I also hate having songs being cut from DVDs. It happens with me all the time and it really annoys me, because the only reason I bought them was tto see the videos of those songs! for example Mr India (1961) didn’t have Main Maachis Ki Teeli. The cutting of DVDs/CDs should be declared a crime. I remember buying Gumnaam just because I love the songs so much (yes, well – I like the film too, but anyway…). And except for the songs in which Helen dominates – Hum kaale hain toh kya hua dilwaalein hain and Gham chhodke manaao rang-rali – all the other songs consisted of only one verse (sometimes less). Yikes! I don’t think my DVD of Gumnaam is that bad…All the songs seem pretty much intact. Thank goodness I can usually find what I want and download it. I hate giving these people any of my hard-earned paise. If they did better, I happily would fork over—but as it stands you just never get your money’s worth even if you pay practically nothing for it. I use them as coasters :) At least the graphics on them are usually fun, even if sometimes misleading. It does explain why I’ve seen people like Helen on dvd covers and then she’s been nowhere to be seen in the actual film. She has been CUT! And, I’ve been so keen to see “Jaal” too! Today I watched “Reshma aur Shera” on a Baba Digital DVD where a whole chunk of the middle had been excised, and since it was the part where Reshma’s family was massacred by Shera’s family…it was a pretty important plot point. Fragments glimpsed in a flashback confirmed such a sequence existed. One ulta-cheapie, “Tarzan ki Beti” seems to have had the film reels transferred out of order on the DVD …but in that case it didn’t really matter. My daughter upgraded me to Google Chrome…but now Memsaab Story thinks I am anonymous (instead of Laura). Perhaps I have corrected this glitch. Not only do you need to write a character actor interview book, but have to start up Bollywood Criterion Collection. So many tasks, so little time. But so many obsessed fans anxiously awaiting! I would find the time! It’s the funding for these ventures that I am lacking. really very disappointed to hear about jaal, since Ive been looking v activly for it. :( lost hope. Around the world only really has the song going for it and Rajshree (i do love her, inexplicable)- so cutting out a major asset’s terrible. Both were so disjointed (Jaal far worse though and I think part of the reason ATW was disjointed is because that’s the way it was made) that it was hard to follow the story, if not downright impossible. I love Rajshree too—she was FAB. Memsaab, we’ve had similarly frustrating experiences. We recently watched several Guru Dutt films on DVD, and found that almost without exception they had been struck from scratched, dim or faded prints that were sometimes missing key scenes. The only way we figured this out in Sahib Bibi aur Ghulam was that (as Anonymous experienced with Reshma aur Shera) scenes appeared in a flashback sequence that we’d never seen before. Our copy of the original Umrao Jaan is missing at least one song as well, and as you say there’s no indication anywhere that the film isn’t complete. Until we start to put pressure on the DVD makers, I’m afraid that nothing will change. Is there any way to find comparisons of the DVD versions of Indian films for the quality of the prints, completeness, etc.? I for one would definitely be willing to pay more for better quality. I think they are all as bad as each other. Believe me, if I could single out even one company that I would feel confidant buying from I would shout it to the skies. DEI/BEI was the only company that actually cared. For example,when DEI/BEI wanted to release Junglee on DVD they discovered that the best source available was a damaged 35mm print. They were only able to replace the damaged footage from a VHS tape. If you check your Junglee DVD you will notice that 10 minutes in chapter 17 and 32 seconds in chapter 20 were restored from that tape. Junglee is available today on DVD uncut only because of the time and effort that was spent to release the DVD properly. Is there any company around today that would do the same thing? Oh thats bad ! Jaal is a good movie with some amazing visuals. Sun ja dil ki dastan is classic. Around the world is fairly decent..
Too bad .. such a shame. I wonder if the consumer court in India can help us with. We could get them involved, or we can atleast have a story done with the press. All we need to do is sent links to the press and tell them what is going on. I have a press database. I don’t think there’s much I can do from here with the consumer court in India—but I am all in favor of people in India doing something about it!!! That’s pretty much the only thing that will engender any change. As long as we all are willing to pay for the crap they foist off on us they have no reason to do anything different (I mean, they SHOULD, just out of pure decency but apparently the only thing they love and appreciate is money). This is the same problem with me too. Some DVD manufacturers cut some really beautiful songs from film. Like before a week i saw the film Chorni, but that disk was badly scratched and kept uncontrolled when i first opened the cover. Then when i saw that film, i was like killing my self because the ending was missing and two songs were cut first the Helen song with a other one.Then the same thing happened with me in Man Mandir, when i first saw this film i was feeling like stabbing myself and the manufactures because two songs were cut from the film along with some beautiful scenes. First the song Tum Abhi Kamsin Ho by Helen and the other is a romantic duet by Nutan and Sunil Dutt (which i later saw on youtube and i loved them). I saw Helen in the credits but then she was missing in the whole film. That makes us so damn frustrated and confusing, that a person who is there in the credits but no where seen in the whole film. So its really a very bad thing that the manufacturers cut off many beautiful songs and scenes!! My DVD of Chorni has the Helen song—but it won’t play! The dvd dies for about twenty minutes, and that song is in the gap. At least it came back to give me the ending, but it’s a totally disappointing experience for sure. I guess I am lucky (?) in that I don’t know what’s missing sometimes, if I don’t know the songs before I see the film (being relatively new to Hindi cinema, I often discover songs from films rather than the other way around)…I can only imagine what it’s like for people who HAVE seen the whole thing on television or something to discover that the film has been so mutilated. People who had the foresight and luck to tape complete films from late night television are incredibly lucky to have those although who could have ever guessed these dvd companies would get away with murder like they do. You have my empathy on this subject once again… I’ve just had another horrible fRINEDS experience in the past few days, trying to watch their new DVD of Patanga (1949). I exchanged one copy of the DVD for another, thinking that maybe some of the defects were just in that one copy, but the second copy was worse! Problems: Unplayable for five out of six tries (at least). Freezes in the middle of scenes and songs. Lighting in scenes gets brighter and darker for no reason. Dialogue drops out for long parts of a couple of important scenes, replaced by background music while we see the actors doing things and moving their lips. (Unless this was a special experimental touch in the the original film(?! )…) And, of course, an obnoxious logo showing much of the time. I found the film itself to be quite enjoyable overall (when I finally got my computer to latch onto it), I like the cast very much, and the C. Ramchandra soundtrack is totally great. Too bad the movie was f****D up by fRIENDS. Don’t think this one had a dropped songs problem, though. My worst experience of that in recent memory was getting Parineeta (1953) (from Baba Traders) and finding that they had dropped the famous doll wedding scene, along with the best song. I’ve had the DVD-rattling-in-the-box problem a few times. But I’ve learned to avoid that – which I can do since I buy them in stores… I shake every DVD before buying it to make sure the disc is firmly in place. I’ve downloaded Patanga…so at least I didn’t pay money for it. I refuse to buy fRIENDS products. I will NOT give them one single cent of my money. My goodness! I thought it was bad enough that a song from Kashmir ki Kali was cut. And the first scene from Nasir Husain’s Jab pyar kisise hota hai. And the first part of Around the world would not play. I just got that in India in a good shop -shemaroo brand. I still have many vhs tapes. Maybe I should convert them?! Reading everyone’s comments makes me angry too about the way the manufacturers chop off scenes. And they talk about piracy. What they do is worse. Shameroo is just as bad as the others. Seriously, they are a total FLOG. *fIENDS and Shameroo* May the universe put them out of business. I had a DVD the other day that had parts of the title credits missing, including the first few stills with the name of the movie and the cast. I didn’t need to know what movie or who I was watching anyway. I can’t read discussions on HF any more, the new format for displaying those threads is awful. My two cents on big names like Eros. Its version of Dushman (1971) had at least 15 minutes or more chopped off from the second half, including a song, that seriously affected the flow of the film. In another instance with Shehzada (1972), inexplicably there was no sound during certain parts, including the last part of a song. Various companies marketing Palkon ki chhaon mein (1977) have made up their minds about which bits to chop off so you only get a sense of things if you cobble together a couple of versions. Bombino is another culprit–you want to gouge out their eyes when you see TWO logos plastered across the scene during song sequences. Bluelotus–let us know please how to go about the consumer court thing. This is why I give no credence to people saying that films are chopped up because the film stock itself is damaged. There are many versions floating around out there, and nobody takes any trouble to find the best of them and put the COMPLETE thing on a disk for us. It’s not really that much to ask, is it? Seems that these manufacturers are all wannabe editors—but it’s clearly NOT THEIR FORTE. If I can at all help with the consumer court thing, by all means let me know! On a happier note, I have ordered a copy of “Rock Dancer,” and will make a point to review it. If it plays! You are a brave woman. Foolhardy, but brave. I salute you and can’t wait to read your writeup. I think these producers of DVD won’t do anything. The only people who can do anything about it are the those people in Pune. And of course the present film personalities who could form a kind of organization to promote restoration of each and every film ever made. The other source could be if the family members themselves. They should restore the legacies left by their kith and kin. I heard Guru Dutt’s son wants to make a film on his father’s life. What a shame that he didn’t first think of restoring those classics of his. Same goes for Kishore kumar’s son. I know!!! You can make all the documentaries about your dad that you want, but if the work that made him legendary disappears all you will be left with is…a home movie! I seriously don’t understand how the wealthier people in the industry can see what is happening and do nothing about it. It’s truly a disaster out there and only getting worse. “South Asia Center: cinema” ? They have been buzzing about a Moving Image Archiving and Preservation Program at the Pune Archive. The academic scholars on this list appear to have contacts and access to the Archive…is there an opportunity for a joint project between these academics and the enthusiasm and expertise of the people communing on Memsaab Story? The Pune archives have supposedly been working on preserving the films they have for a while, but they don’t seem very willing to share their treasures with the public at large by releasing them on dvd. Some people I have talked with have said that in fact their attitude there is largely one of horror at the thought of releasing their archives to “the masses.” I hope that’s changing or not completely true, but I will believe it when I see it. Do you have a link to the list serv? Thanks at last for discussing dvds manufactured by indian manufacturers. Now you know what we go through watching these horrible dvds. EROS I think is the big culprit. They brought out series entitled ‘Nasir Hussain Collection’. Expecting to watch movies like ‘Phir Wohi Dil Laya Hoon’, ‘Jab Pyar Kisise Hota Hain’ etc., I brought the entire collection. What a waste of money when I found out that the latter movie was cut mercilessly and the colour disappeared from the former movie. Incidentally, their old edition had bright colours but, horror of horrors, I found that the disc had cellotape pasted on it when I opened the box and the disc would not play beyond a certain point. Oh I’ve talked about it before (https://memsaabstory.wordpress.com/2009/11/29/rant/). As I said, many times I am not aware of what is missing since I didn’t grow up with the films. But I am reaching the point of assumption that whatever I get is probably only about 75% of what was there originally, which is really a SAD realization. And they do release originally colored films in black and white (Zimbo, eg!!! A Wadia Bros spectacular, which certainly should be seen in color if it was made that way!). I couldn’t believe it when I discovered that fact, but it is true! It’s appalling, it really is. I can say with 100 per cent agreement that all VCDs are only 80 per cent of the total length of the movies. Latest example is BAROOD on Friends, at least 20/25 mins is missing, partly the cuts cud be bcos of the master print itself which must have been in shambles. These guys chopping songs esp from DVDs, and well also VCDs, and care a damn about the quality are a disgrace to mankind,yeah. They will not even try to improve, but am glad Moser Baer is one who is doing a much better job with their releases. Some of these guys even put two discs together and without any individual wrapping, like a plastic or paper envelope. I mean come on, how can yu be so unprofessional and cheap.Full of finger marks and what not. Oh yeah EROS cut out a full song from Phir Wohi Dil Laya Hoon DVD, I complained twice but never even got a reply. And this movie was out and out a blast with super songs !! And unfort my VHS got destroyed booooooo. Did I hear some1 say complain to Consumer Council in India, pls have a look at their Website and see how easy it is to lodge a complain. They are as good as these lousy Companies who dish out sxxx.Toothless bulldogs, sry doggies dont mean any harm to yu ! But then beggars cant be choosers really and I simply bear it with whatever I get… now am talking abt Friends who has some very rare titles with them.. at least I have the pleasure of watching half a movie. And mind yu we have lost lots of treasure of many movies, just because we did not have proper storage facilities, the carbon prints caught fire or simply melted away. A shame really, heritage lost for ever !! I don’t think Moser Baer is any better. Their “Platinum Series” is a JOKE. You can call something “Platinum” but if it isn’t, the label itself won’t make it so. Would love to hear why you think they are? Beggars can’t be choosers, but why do we have to be beggars??? I have Bombino and Ultra Vcds purchased donkeys years ago, and now Moser has taken over quite a few of the rights and these VCDs are much better in quality, even the discs they use are umpteen times better since they make them themselves and above all, there is huge price difference, then and now. 2. Beggars we shall remain unfort as long one Company sits with the rights and dishes out crap quality and incomplete movies, what choice or options do we have really ? Our Consumer laws here have no teeth really so where do we go and lodge a complain. The Co. never ever ack any letters or emails. Just see what T Series sells, horrendous dvds and vcds ! Luckily most of my newer dvds are ripped and the the guys who post them on the other side/s, do quite a bit of a job on the originals. My collection for yester years is majority of Vcds from almost all Companies, so one can see the stages they have been thru… or well some of them thru no stage at all. I knew a guy who was with one of the Companies who gives out this crap and he simply admitted, we do not know what QC is ! They churn out discs on the factory floor and not one is given a check, no wonder some of the movies I purchased and evt got them replaced have the same issue and the same problem on the same spot ! They never heard of a Quality Control Manager. Do you have Sampoorna Ramayan (1961) on Bombino vcd? Shemaroo, Ultra and Baba DVD have cut scenes from their releases but Bombino is the complete version. Oh Gosh, Memsaab I am right now in India and bought a few of the so called platinum series of Moser Baer esp some of the classic Guru Dutt movies as well as ones like Howrah Bridge. I was intending to watch these at home on my return! Say hi to India for me!!!!! Esp. Hyderabad, loved it when I was there. will do ie convey ur love and hi to hyd. About quality of Guru Dutt movie DVDs, will do after reaching home! The issue of replacing a vcd/dvd which is damaged with another which proves to be damaged in the same spot is a very old complaint of mine. It’s actually how I got started downloading films—I began doing that to replace dvds which I had bought that didn’t work. And discovered, as you point out quite accurately, that a lot of guys on these d/l sites actually put some effort into improving the quality of the picture and the sound. As long as these companies continue to churn out this garbage I have no compunction at all about pirating. They deserve nothing better. I can safely say I have replaced at least 20 per cent of my oldie vcds with the dvds. Guys who have worked on them and posted these dvds,they sure have worked many hours to improve on it. Latest is SINGAPORE of Shammi Bhai. So surely it is possible to release better quality, these Companies certainly do not lack financial resources ! I was pretty annoyed too when I got the dvd of Jaal. It was an insult to all who had anything to do with it. There have to be laws against this sort of stuff. Of course i had heard of the movie for years before I ever got the dvd. My uncle, K.N Singh often counted it amongst his best ten. Hi Ajay :) Yes, it is a total insult to anyone who had anything to do with it, and to we fans. At the very least they should inform consumers that the film is massively incomplete! There should be laws against passing these things off as movie dvds, something which is true of MOST Indian dvds. Just want to share with you that I too purchased Phir Wohi Dil Laya Hoon on ebay and ended up disheartened and frustrated with the poor colour print and the omission of the song zulf ki chaaon mein which I feel is one of the movie’s EPIC songs. I also suspect that there could have featured some romantic scenes between Joy and Asha also removed in dvd version.The quality of the movie was a terrible disaster. I too would be willing to pay for the full uncut original of this movies and would also be interested in Teesri Manzil for the same. Please can anyone help?